A grainy image looking up a hill towards a homestead consisting of cattle byre (luak), fenced enclosure and two step-thatched sleeping huts. 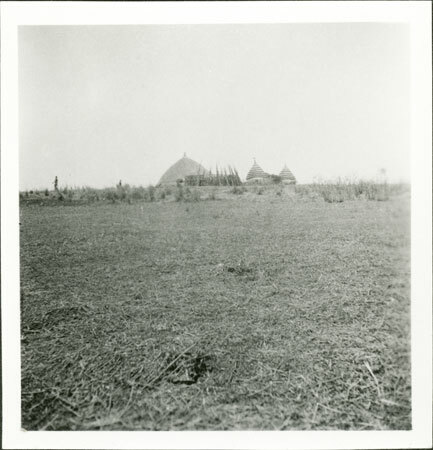 Nuer built their homesteads on raised sand ridges so as to avoid the flood-waters of the rainy season. Note on print reverse ms pencil - "109 10"
Morton, Chris. "Nuer homestead" Southern Sudan Project (in development). 03 Jan. 2006. Pitt Rivers Museum. <http://southernsudan.prm.ox.ac.uk/details/1998.346.289.2/>.